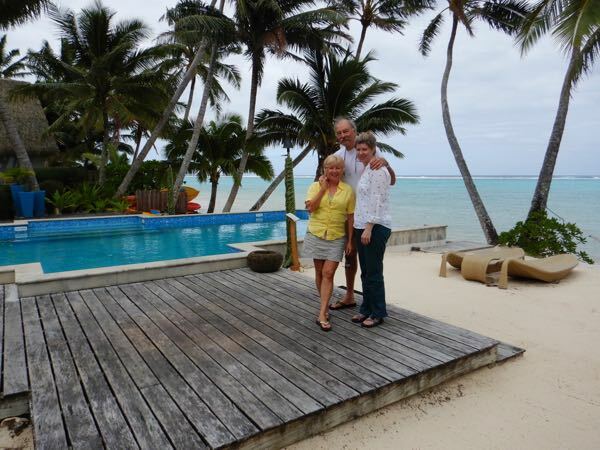 We do love Rarotonga! The people are so kind to one another and the island is so beautiful. There are only a 12,000 residents of the island, so one not only knows but can be related to a significant proportion of them. As we were walking on Monday (it's Tuesday as I write this), we were joined by nicely but casually dressed older man with whom we talked as we strolled along. 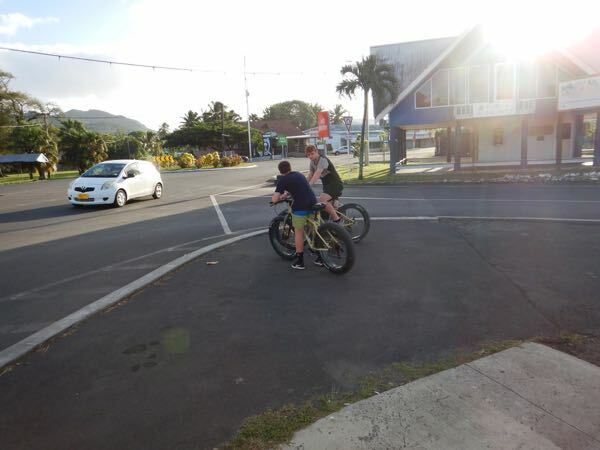 In the end, he offered to take us for an hour's ride around the island in his time off. Sure! He gave us business card and asked that we meet him today at 1100 hours. After enthusiastically agreeing, we read the card; Peter Marshall, New Zealand High Commissioner for the Cook Islands! Wow! He spent his lunch break taking us around his home island and giving us a tour that few could imagine. 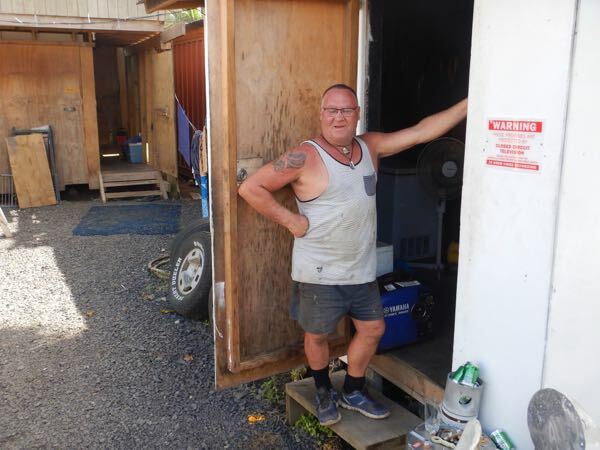 And all because he's a thoughtful and kind person, as are all Cook Islanders. Thank you, High Commissioner. 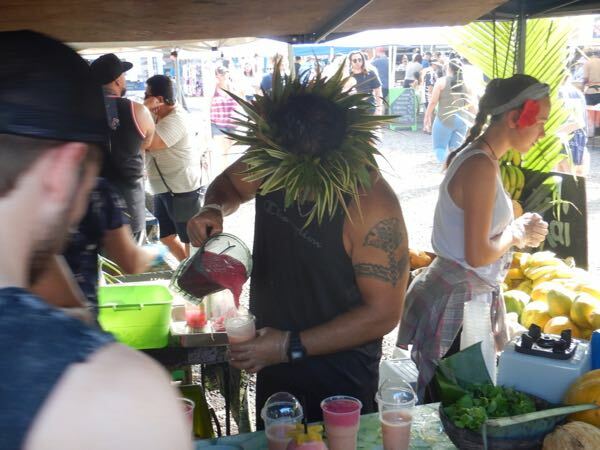 During Saturday morning's tour of the Punanga Nui Market, we enjoyed a superb fresh fruit smoothie, created by this artist. The top layer is a passion fruit mix and the lower portion is banana-based. Best we ever had. 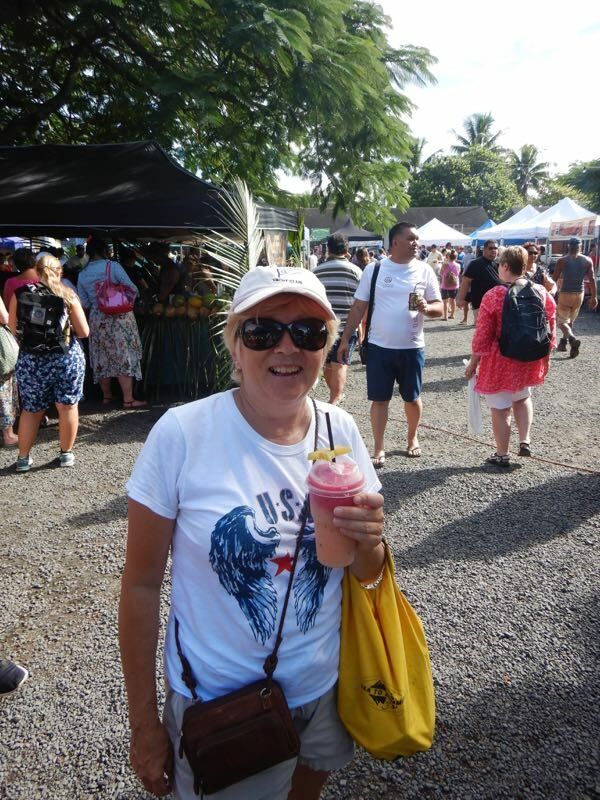 Lovely Conni and her smoothie, ready to enjoy the market. 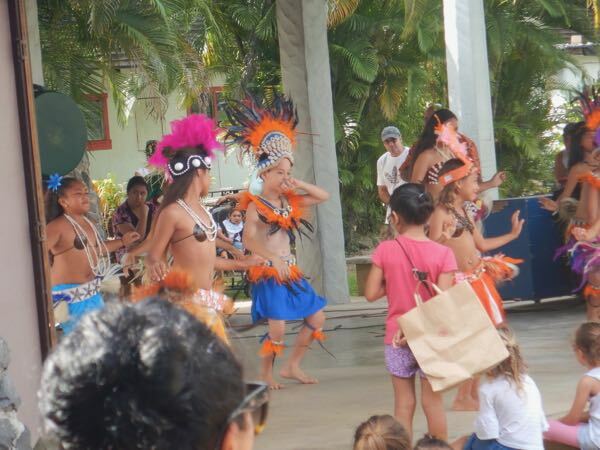 The final act of the kids' presentation of native and traditional dance was this both-gender dance. There were kids comfortable with the spectacle and those who were not. 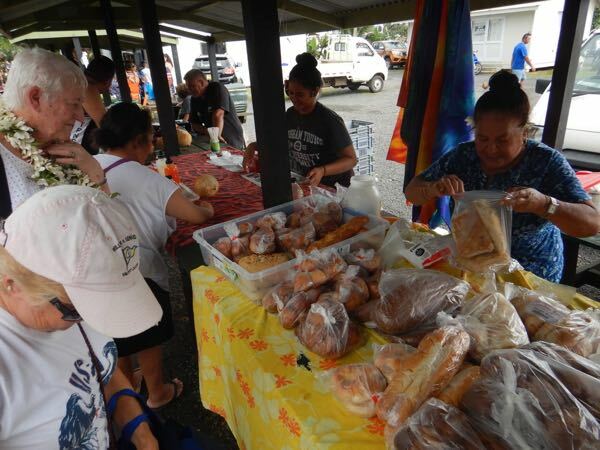 The breads offered for sale were wonderful and locally made. 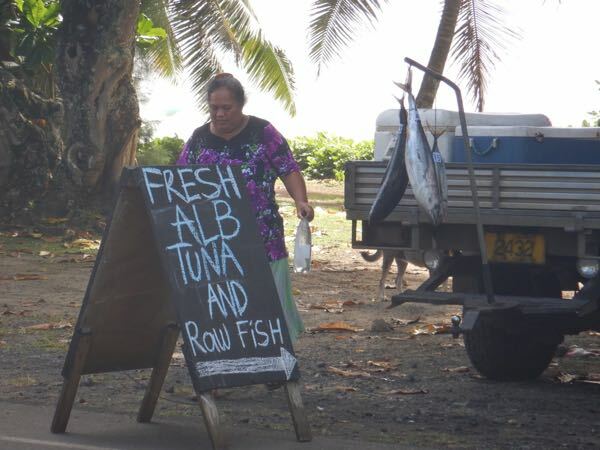 We walked to the airport, about 30 minutes, to meet Julia's flight, passing this roadside seller. There are characters and characters, and then there's Keith. Keith buys and sells marine...stuff. He's had an interesting life and business. 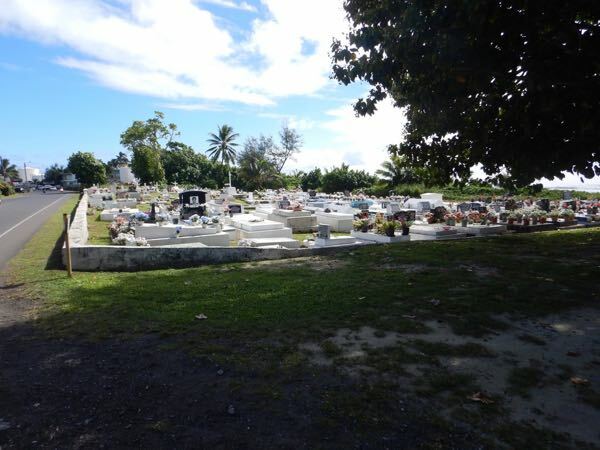 This is one of many large cemeteries on the island, with all graves above ground: it's hard to dig in coral. Many of the gravestones include images of the deceased. 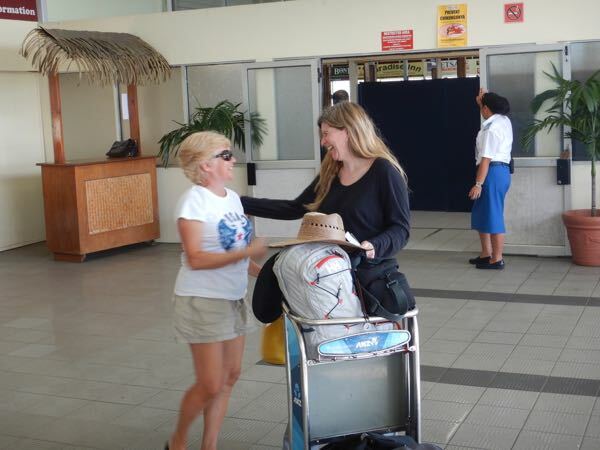 Lovely Conni greets the just-arrived Julia. 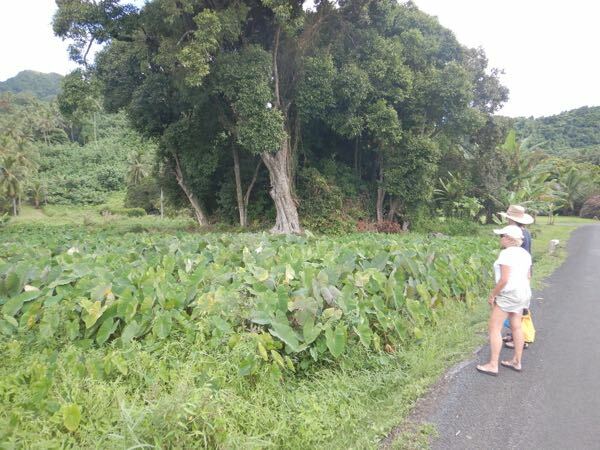 Lovely Conni and Julia admire a lush crop of taro. 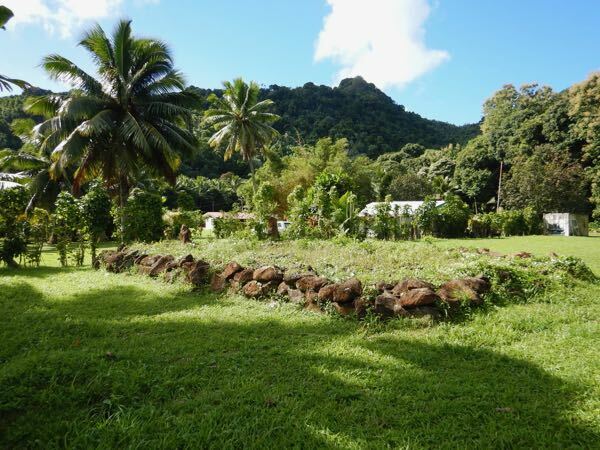 This is the only marae that we've found on Rarotonga, and had no idea that there were any. We've seen so many that we recognized it immediately. 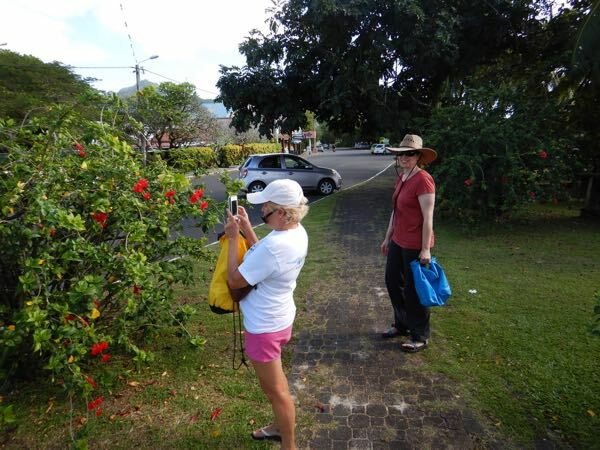 Walking in the median of the very wide boulevard that runs along the water's edge, Conni photographs a hibiscus. 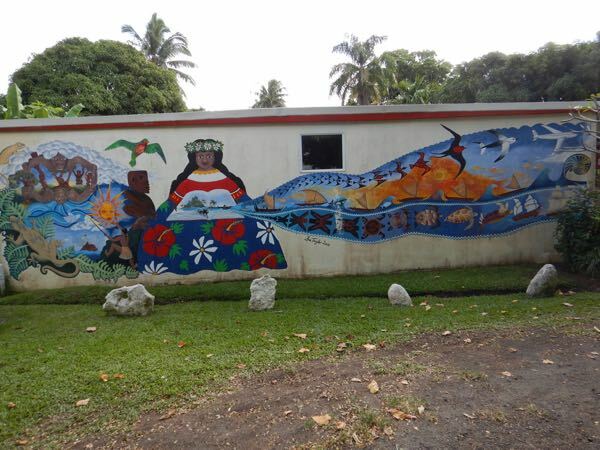 We happened across this lovely locally-painted mural depicting the history of the people, beginning with some creating myths (at left) and on to frigate birds transforming into aircraft. 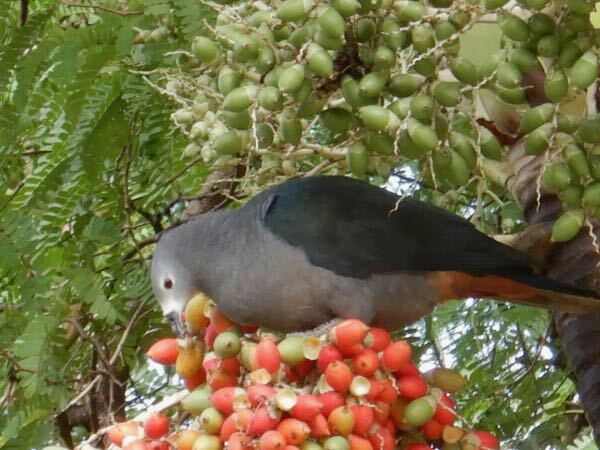 Julia spotted this bird first: a Pacific pigeon, in this case, feasting on Christmas Palm fruit. James Cameron of "Titanic" fame, spent quite a few years in the South Pacific islands. 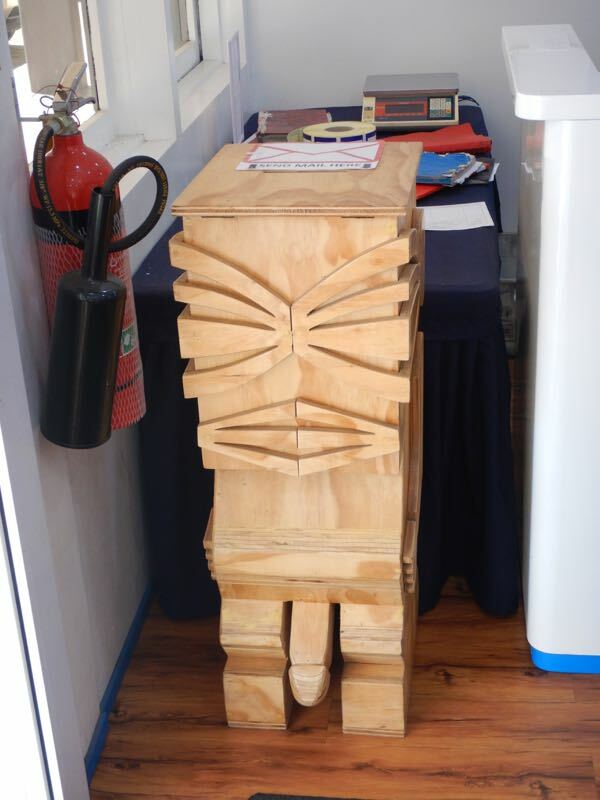 A tree in Bora Bora, for example, he used a tree as his model for the "Tree of Life" in Avatar. 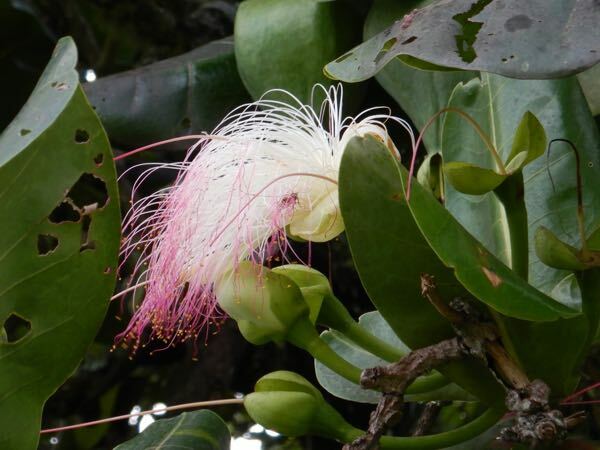 Surely he used these seed flowers as the model for the seeds from the Tree of Life that floated around. After a long walk, Conni and Julia enjoy a coffee, while I enjoy a Mojito. They look tired. Odd, but there are a lot of fat tire bikes used here. Sand? I have no other guess and we've not seen them elsewhere other than in Alaskan winter. During our trip around the island with High Commissioner Marshall , we stopped at several upscale resorts to which we would have been banned. 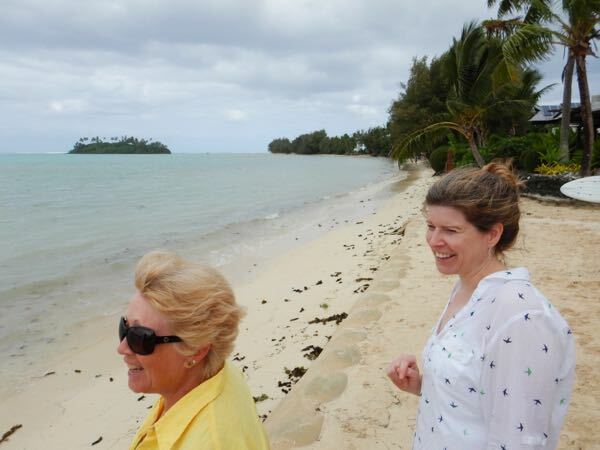 Here, Conni and Julia admire the Muri Beach waters. 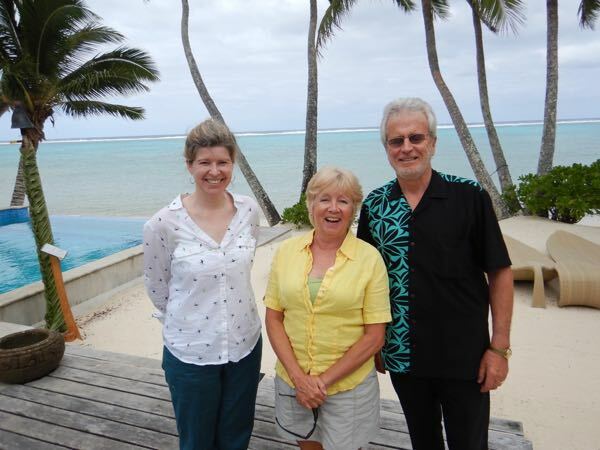 Conni, Bill and Julia pose before the beautiful grounds of this resort. Julia, Lovely Conni, and High Commissioner Peter Marshall pose. He was a wonderful and thoughful host. 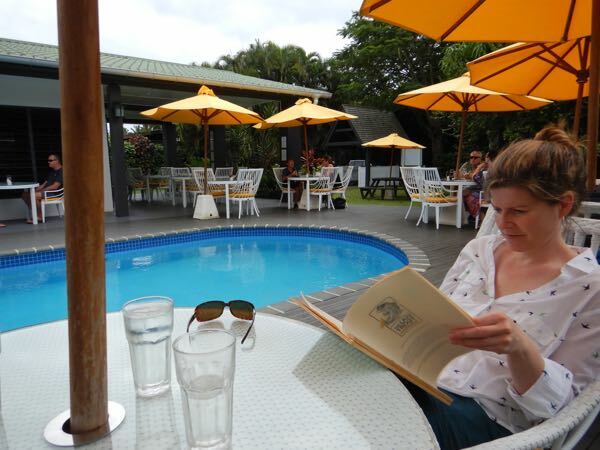 High Commissioner Marshall recommended the Lazy Trout as a good restaurant. It's a lovely location. 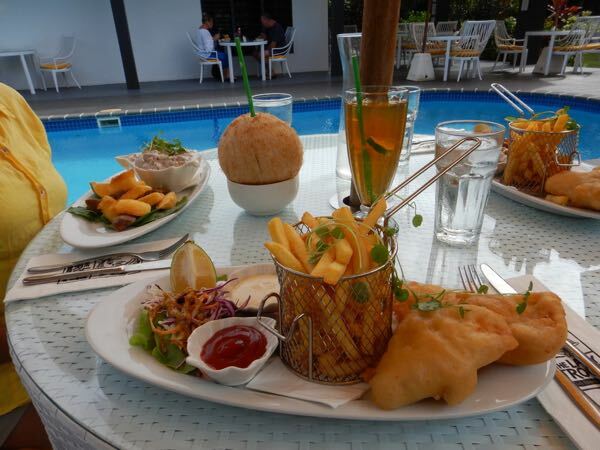 Conni enjoyed the ceviche and coconut milk, and Julia and I enjoyed Mahi-mahi "fish and chips"